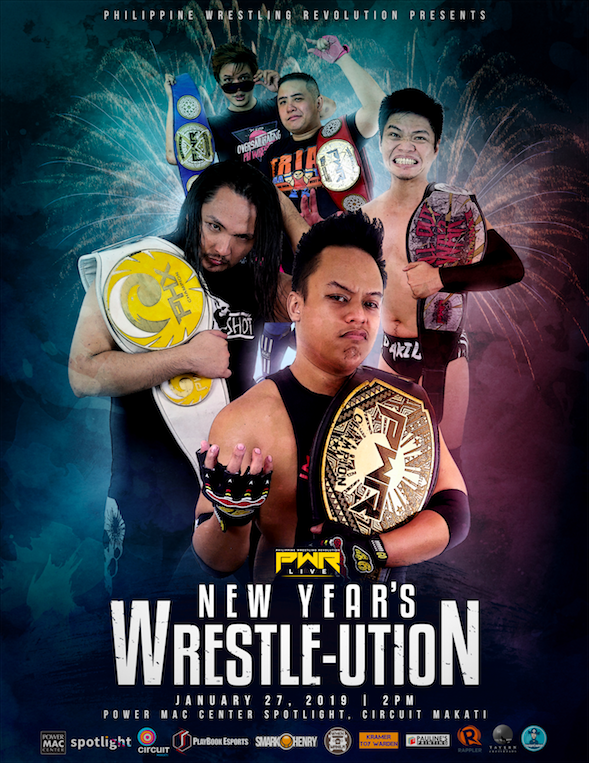 Marks and smarks, let's begin our year of Philippine wrestling at the Power Mac Center Spotlight for our very first PWR show of the year, PWR Live: New Year's Wrestle-ution. Join us as we watch another hard-hitting afternoon of wrestling as we see new match-ups unfold as well as old rivalries be showcased. Are you missing this afternoon’s show? Then, keep checking and refreshing this page as we bring you live results of PWR Live: New Year's Wrestle-ution! A debuting Jaye Sera defeated Jhemherlhynn (w/ Tita Baby) via pinfall. "El Guapo" Carlos Zamora defeated Kapitan PWR via a Swanton Bomb. Vlad Sinnsyk won against Super Vintendo via a sick Clothesline From Hell. Post-match, Sinnsyk sent out a threat to John Sebastian and his PHX Championship. QUATRO beat Mike Madrigal via submission in a hard-fought battle. Madrigal put QUATRO through a table after the match. The Punk Dolls (Robynn and Martivo) bested the teams of MSG (Main Maxx and SANDATA w/ Mr. Sy) and the Kakaibros (Kh3ndrick and Mh4rckie) to move on to the next round of the PWR Tag Team Championship Tournament. Crystal got the win over Chris Panzer by roll-up and a handful of tights. Mr. Sy appeared after the match to offer Panzer a spot in MSG to which he accepted via handshake. Dax Xaviera (c) retained the All Out War Championship against Alexander Belmonte III. Joey Bax came out after the match and gave Dax a Slingblade to send a message. Ken Warren defeated Jan Evander (w/ The Apocalypse and Super Vintendo) via Wi-Fi. The End Game tried to attack Warren after the match which brought out a returning Chino Guinto for the save. Chino cut a promo afterwards and hit Warren with a Curb Stomp before leaving. The YOLO Twins (Yohann Ollores and Logan Ollores) beat The Naughty Boys (GrabCamus and Kapitan Tutan) and RevoRanger and Bolt when the Twins hit the Two Night Stand on Kapitan Tutan to advance to the next round of THE PWR Tag Team Championship Tournament. Jake De Leon won against John Sebastian (c) via DQ when Sebastian hit JDL with a low blow. However, Sebastian remained the PHX Champion. Vlad Sinnsyk would come down to chase Sebastian away post-match. TDTxECX (Trian Dela Torre and Evan Carleaux) (c) defeated the team Ralph Imabayashi and Cali Nueva (formerly Artie 2.0) via tap out to retain the PWR Tag Team Championship. And that's the show folks! Did your picks win for the night? Watch out for the official Smark Henry review of PWR Live: New Year's Wrestle-ution and see you at the next show!